Automate.io is an online solution that lets you integrate LiveChat with apps that help to automate marketing, sales, and business processes. 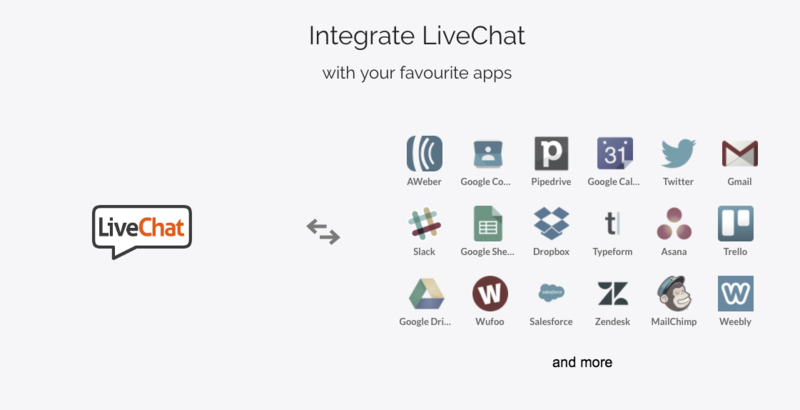 You can connect LiveChat with such tools as Typeform, Wufo, Google sheets, Google Drive, Gmail, Trello, Slack, Asana, Salesforce, Zoho, Jotform and many more. Create contacts or tickets in your CRM or customer support apps instantly. Create workflows across your apps that run as soon as you complete or tag a chat. Take advantage of smooth automation. Streamline your marketing activities and gain more customers. Start using LiveChat with Automate.io now!